In answer to the question of whether cold calling gets a bad press, this could be a very short blog. We have all had PPI calls at home and on our mobile. Ever suffered over- scripted insurance calls? Or the typical offshore welcome greeting ‘hello, how are you today?’ So, maybe bad press is deserved? No-one likes to be bothered in an evening, on their mobile or at work by a cold caller. We’re all resistant to that. So, it’s totally understandable that cold calling perhaps gets a bad name. But is it fair to tarnish every cold call with the same brush. B2B Telemarketing is a well-established and well used route to market for lots of businesses large and small. It tends to be very effective where the value of sale may be larger and prospects don’t respond to traditional marketing methods. No method of sales prospecting or marketing is fool proof. Few solutions are guaranteed to deliver results in the nature or number you need. Most sales lead generation requires an understanding of the target market and a consistent approach to reaching prospective buyers. Most marketing methods need to build momentum. Whether that’s a PR presence, advertising awareness, PPC or some other solution. Cold calling is the same. It’s fair to say that some people will not respond to a cold call. Does everyone respond to advertising? Do we act on every piece of direct mail or email we receive? It’s certain that prospects are more likely to respond when they are in the buying cycle. Unfortunately, unless you have a good online presence with strong content on your site and across social media, prospective customers may not just happen upon your business through search. A lot of business is done through recommendation. But most businesses can’t totally rely on that for all of their new business and lead generation. Hence, they need to undertake some prop-active outbound activity. As I mentioned earlier, no method of marketing is a cure all. No single approach will work every time and generate floods of enquiries. So, if telemarketing is a consideration for your lead generation strategy, what are the benefits? Personal interaction and engagement– The higher the value, the more there is a need for communication. Senior level buyers often need to filter to shortlists and one way of doing this is an initial call. Contact them at the right time and build rapport and you can get onto more shortlists. Technical information – Being able to explain the finer points of the benefits of your service can’t be done other than by a conversation. Feedback – Personalised communication through telemarketing allows for information gathering and research that supports the sales process. Consistency – With other methods of marketing you generally have to keep starting over. With telemarketing, success is often driven by calling back and engaging with prospects over a period of time. You can identify renewal dates, project start dates, new financial year start dates when funds are available for your services and so on. Many of our most successful appointments have been on the 7th or 8th call to a prospect spanning a period of months. Maximise the value from other forms of marketing – Ever done an email campaign or direct mail and not followed up. That’s almost criminal when you’ve invested in the activity. Telemarketing amplifies the impact of your other marketing. You can target just those that clicked through or opened the email. We’re about to follow up an expensive and impactful mailer to independent schools. It makes sense that our client’s investment is maximised by following up shortly after the mailer. Focus on the best prospects – Telemarketing research refines the targeting and focuses attention on your best prospects. If you segment your market appropriately, ultimately you should end up with a carefully tailored list of the best prospects for your business. You build and cleanse your database as you make calls. You can then focus all your marketing activity (not just telemarketing) on reaching out to them in a consistent manner over time. It still remains a fact that some cold calling is annoying and ill-targeted. Sometimes callers are poorly trained, over-scripted and fail to build rapport that’s so essential to effective appointment setting for bigger ticket items. 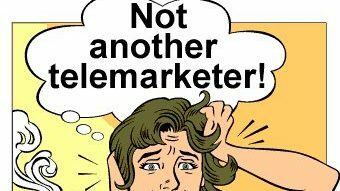 Telemarketing is not necessarily a short term fix. There are campaigns that deliver results quickly. That’s generally where we can identify the target audience (including the right job roles and names) with good data and where there is some reason why the prospect might engage. Is there new legislation that drives interest? Do you have some new technology or an innovative approach? Have you got a way for them to save money or improve productivity? Can you safeguard something that’s important that isn’t currently protected? These kinds of propositions drive outcomes. You definitely need a good caller that can build rapport and can engage with senior decision makers if you want success from calling. There are rogue callers and poor quality campaigns. But cold calling can be extremely effective in the right circumstances. It’s almost certainly the fact that telesales is a people business that gives the industry a bad name. We’ve all had bad experiences with cold callers. Equally, when it comes to generating new business, expectations are high because new business is important. Sometimes short-term results can disappoint. But isn’t that the case with most methods of marketing? And with other types of marketing, they can also often prove very expensive for very little. That’s not to say other methods don’t have an important role to play or that telemarketing is inexpensive. For cold calling to work, you need to invest and do it consistently over a period of time to build pipeline and to nurture potential future leads. Ultimately, your choice comes down to what suits your business and what you’re trying to achieve. However, at least with telemarketing, you have the opportunity to refine your target list and it’s unlikely you’ll get nothing for your investment. I’m not sure the same can always be said for other lead generation solutions.